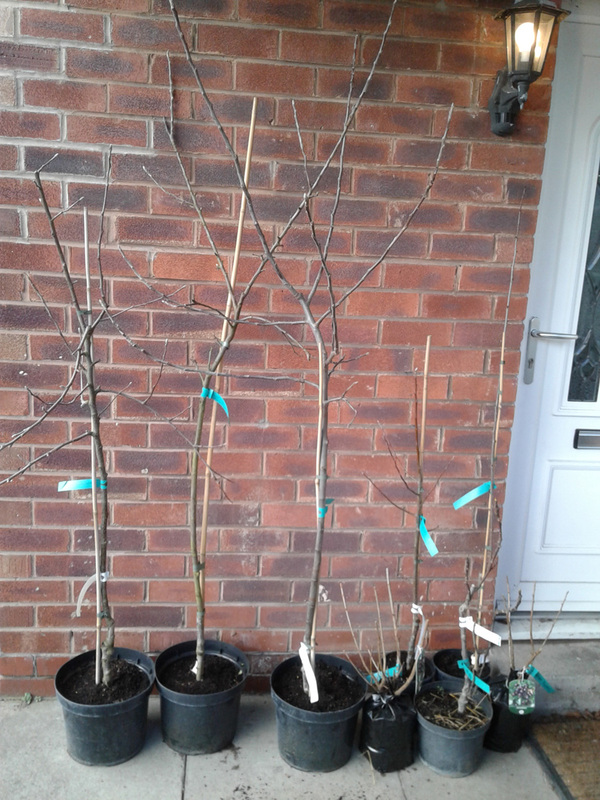 Our Fruit Trees are Here! Last summer, on the way back from our garden-visiting holiday in Kent, Jo and I stopped off at the National Fruit Collection at Brogdale. It turned out to be the day of their annual cherry festival, which looked like a huge amount of fun, but we weren’t there to eat pie or spit pips. No indeed, we had only one thing on our mind: apple trees. We had two apple trees at our old place – prolific ‘Discovery’ and zero-fruiting ‘Bloody Ploughman’ – and we knew that when we moved we’d really miss having fresh fruit to pick from right outside the door. They’re also an essential part of our Cottage Garden Project plan; to include a good mix of herbs and edibles amongst or alongside the mainly decorative planting beds. …until, as I sat in the pub after my four RHS exams on Tuesday afternoon, a text came through from Jo to say that the end of our driveway was now occupied by a pallet of trees. Huge excitement! Couldn’t wait to get home and take a look. Couldn’t see much in the dark when I got home, of course, except that the order seemed to be all present and correct, and was well-wrapped in cellophane. Yesterday morning, I headed outside with my trusty knife and, like a kid at Christmas, unwrapped our delivery. Now that’s the sort of delivery I’d be happy to come home to any day. First off: I was very pleased with the manner of the delivery. Although I was out, due to a minor mix-up as to the delivery date (which was entirely my fault for saying “any time after the 7th” rather than stressing “the 8th onwards”…) the delivery driver still not only dropped them off, but fork-lifted the pallet up the drive and placed it neatly behind the bins into the bargain. Fair play and thank you to them for making the extra effort. 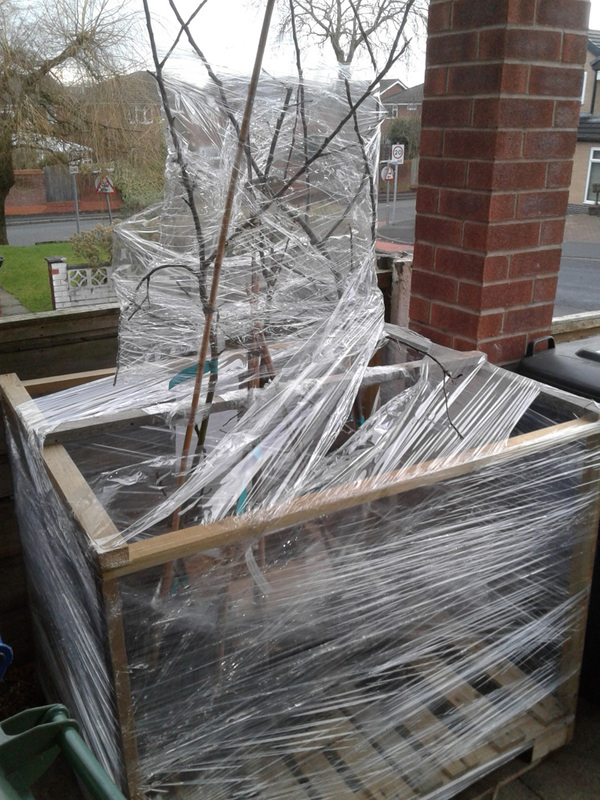 All the trees were in great condition; a couple of small twigs had snagged in the cellophane and snapped, but nothing worse than that, and certainly nothing you wouldn’t expect on a journey from Kent to North Manchester. Removing the cellophane wrap reveals… trees! The full line-up: three apples, and ensemble backing group. Two of the trees – the crab apple and the fig – are quite small, but that works to our advantage. We don’t want the crab apple to grow too big, based on where we’re hoping to place it in the planting scheme, and the fig is hopefully going to be quite vigorous, so starting off with a small specimen gives us a chance to prune and train it to suit the space. A close-up of the fig, crab apple, Morello cherry and 2 Jostaberry bushes. Malus domestica ‘Herefordshire Russet’: M27 rootstock (extreme dwarfing). Pollination group C(3). Diploid. Harvest September. Malus domestica ‘Cornish Aromatic’: M9 rootstock (dwarfing). Pollination group D(4). Diploid. Harvest September. Malus domestica ‘Blenheim Orange’: MM106 rootstock (semi-dwarfing). Pollination group B(2). Triploid. Harvest October. Malus ‘John Downie’: M9 rootstock. An effective cross-pollinator for all three maincrop apples and a source of fruit for crab apple jelly, as well as pectin for other fruit jams. Prunus cerasus ‘Morello’: G5 rootstock (semi-dwarfing). Self-fertile. Shade tolerant. Harvest July to August. Ficus carica ‘Brown Turkey’: Figs are propagated by hardwood cuttings, so no rootstock applicable. Self-fertile. Pollinated by Chalcid wasp. Harvest when ripe, late summer onwards, hopefully. 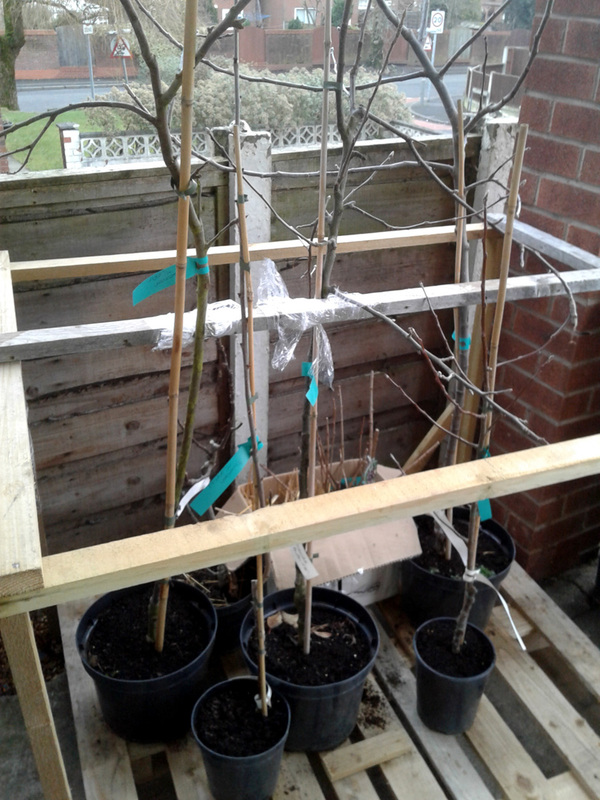 The next stage will be to transfer the three apples and the cherry into the Air-Pot containers that we’re planning to grow them in for the first few years, at least. All the varieties are grafted onto dwarfing or semi-dwarfing root-stock, so we’re hoping they’ll develop strong root systems, courtesy of the Air-Pot’s air-pruning characteristics and not suffer from having a lack of open ground to grow into. Formative pruning will be carried out after potting, either as columnar cordons or compact bush shapes. The idea is to fit all four potted trees along the fence outside the back door, without risking the branches becoming congested or tangling with each other. I’ll be reading up on the pros and cons of both methods before I make any cuts, and asking the gardeners down at Ordsall Hall for their advice, when I’m down there volunteering tomorrow. The fig will be planted into the fig-pit that I prepared last summer. And the crab apple will be planted out in pride of place in the shed bed, once that has been suitably edged, back-filled and the soil considerably improved. It should be happy enough in its pot until that’s done. What do you reckon? All sounds good, or is there anything I’ve over-looked? Are you a bit of a pruning expert, or have you grown potted fruit trees yourself? If so, I’d love to hear about your experiences, down below in the comments. I hope that they do well for you. We started with one jostaberry which grew very quickly so I cut it back. I decided to see whether I could root some prunings and ended up with five bushes on our plot and gave a few away. They are really easy to propagate. Thank you, Sue. I’m looking forward to seeing how the Jostaberries grow on our plot. They certainly looked healthy and strong enough when I planted them out yesterday. I’ll bear the cuttings in mind, thanks. Personally I really love fruits trees. As Sue Garrett says I was also started with a single plant and hope that it will grow up quickly to cut bushes and dig in my plot. Hi Bella – taking and striking cuttings is a great way to multiply soft-fruit bushes and canes, certainly. It’s a bit trickier with top-fruit trees, as they need to be grafted onto appropriate root-stock. 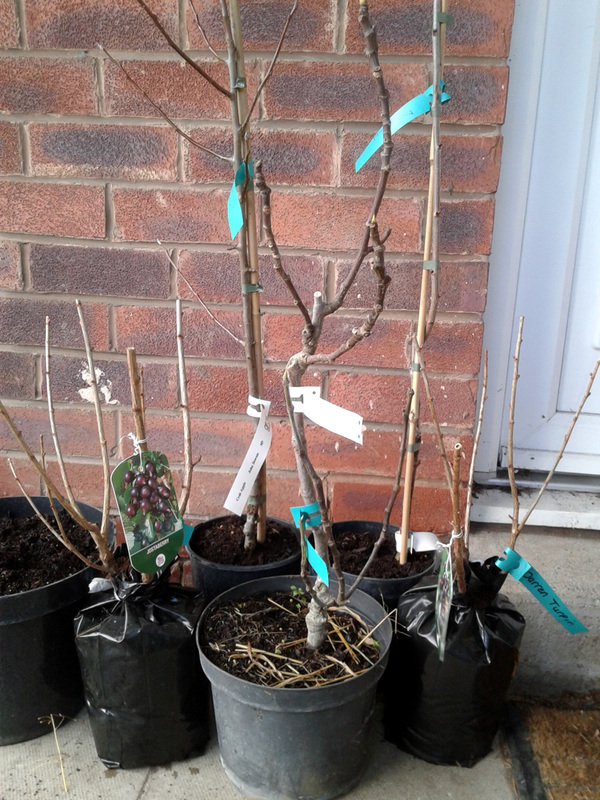 It’s generally best to buy pre-grafted trees from a good nursery, unless you’re keen enough to go on a grafting course and learn the techniques involved. That could be really interesting. GYO fruit, veg and flowers on Plot #59 and developing a 20-tree orchard on Plot #79, Langley allotments, Prestwich, North Manchester. So, You Want to Be an Allotmenteer? Welcome to Your New Plot. The Hard Work Starts... Now. Follow Darren's board Plot #59 on Pinterest. All text and images by me, Darren Turpin, unless otherwise specified.